One of the best things about weddings has to be the wedding dress. With all eyes locked in on the bride, the right wedding dress can make for a magical wedding. The wedding dress is an essential part of any dream wedding. Finding the right wedding dress for your fashion style, wedding theme, body type, etc. can sometimes be more difficult than anticipated. Don’t worry though; this list will get you headed in the right direction and one step closer to your dream wedding. So look through this list and find a few of your favorite designers. Once you are able to do that, you will be able to find your perfect dress in no time. Are you looking for more wedding related lists? Make sure you visit our list of wedding sites and wedding favors. Before you know it, you are going to be way ahead on your wedding planning timeline. Based out of New York, Lebanese fashion designer Reem Acra’s designs are luxurious and sophisticated, but with a modern twist. Acra’s wedding dresses are an excellent fit for brides looking for glamorous and updated designs. Monique Lhuillier began designing wedding gowns after her own search for a gown proved difficult. Today, Monique Lhuillier is known for soft, feminine bridal creations. Her bridal designs are a sure bet for brides looking for sophisticated luxury. Jim Hjelm dresses are known for delicate embroidery and unique detailing. His wedding dresses are an excellent fit for the bride who values intricate details. And, while all of the dresses that Jim Hjelm offers are known for their intricate design, the collection also features a wide array of silhouettes and styles. This is perfect for the bride who wants options. Based out of Barcelona, the Pronovias brand features three wedding dress lines. These are; Atelier Pronovias, Pronovias, and Elie by Elie Saab. The Pronovias style is best highlighted in its seven traditional silhouettes. Silhouettes like the kaftan, halter, and mermaid, allow brides to look stunning on their special day. Based in New York, Vera Wang bridal has been a staple in NYC since the 1990s. Today, Vera Wang’s designs are known for sophistication and modernity. A number of celebrities also wear Wang’s designs. Brides should have no problem finding the perfect dress among Wang’s creations. The Maggie Sottero brand is known for luxurious fabrics, fit, and affordability. Swarovski crystals also feature heavily in many of the designs, perfect for the bride looking for that extra bit of bling. The Herrera fashion house is internationally known for its classic elegance. Carolina Herrera has also dressed a number of First Ladies, including one of the more recent First Ladies, Michelle Obama. For a classic, feminine look, Carolina Herrera wedding gowns are a no-brainer. Established in the late 1980s in the United Kingdom, the Jenny Packham brand is known for both bridal and evening wear. With a contemporary approach to bridal design, Packham designs are both distinctive and eye-catching. Lazaro bridal creations are quite glamorous. They feature dramatic silhouettes, delicate beading and embroidery, and the judicious use of color. For brides looking for modern romance with a touch of whimsy, Lazaro wedding gowns are not to be missed. Oscar de la Renta has dressed icons like Jackie Kennedy and Audrey Hepburn. Now passed away, de la Renta’s designs still live on. The bridal collection features classic designs that sophisticated brides turn to year after year. If you want to look elegant and timeless on your wedding day, Oscar de la Renta is a sure bet. Eve of Milady is known for its intricate embroideries and unique laces. It is the perfect label for the bride that wants to stand out. Designed by Eve Muscio, a premier wedding dress designer, the dresses feature fabrics sourced from around the world. If all things lace and embroidery are your style, then Eve of Milady is not to be missed. You will have to go to NYC to try on any of these dresses as they are exclusive to the famous Kleinfeld bridal store in New York City. After you see a few of the wedding gowns though, you will gladly be willing to visit the Big Apple. Danielle Caprese’s bridal collection features a variety of updated classics. With her dresses, modern necklines, low backs, and embroidery feature prominently. Also, the collection is available in sizes 2 -32, making her dresses an excellent choice for any bride. Demetrios is known the world over for its unique wedding dresses. With everything from classic to romantic to glamorous gowns, Demetrios is the perfect choice for the bride who wants it all. And, with locations worldwide, brides everywhere can access all that Demetrios has to offer. A world-renowned fashion designer, Lebanon born Eli Saab also has an exquisite bridal collection. Contemporary and feminine pieces are the hallmark of Saab’s collection with a focus on attention to detail. If you are looking for a quality designer bridal dress, Eli Saab is a great place to start. Jenny Yoo features both bridal dresses and bridesmaid dresses. The line utilizes rich silks, chiffons, and cotton to create elegant, feminine, tailored looks. A focus on cut and proportion, along with quality, ensure that you will look your best on your special day. Perhaps best known for her appearances on the bridal show “Say Yes to the Dress,” Pnina Tornai is a globally renowned couture wedding dress designer. With her Moroccan and Egyptian heritage as inspiration, Pnina creates larger than life gowns that feature intricate details. If you want all eyes to be on you during your special day, the Pnina brand is a great choice. If a designer gown is what you are after, Valentino is an obvious choice, and for a good reason. Valentino is a king in the fashion world, and his creations are truly exquisite. With an emphasis on timeless, elegant dresses, Valentino knows how to accentuate the body perfectly with tailored pieces. A famous dress and couture dress designer, Zac Posen’s designs have been worn by Michelle Obama, Uma Thurman, and many other celebrities. Zac also has a more affordable bridal line, Truly Zac Posen that is exclusive to David’s Bridal. Posen’s glamorous wedding dresses feature his signature architectural seaming, body-contouring silhouettes, and intricate detailing. You will have to plan a trip to NYC for Dennis Basso’s wedding dresses, but it will be well worth the trip. His designs have been worn by leading ladies like Nicole Kidman, Meryl Streep, and Catherine Zeta-Jones. His selection of wedding dress will have you looking like a leading lady of your own for your wedding. After working at Dior, wedding dress designer Lihi Hod returned to her native country of Israel where she opened her signature designer wedding dress studio. Luxurious materials and meticulously handcrafted details are the hallmarks of Hod’s designs. And with each dress tailor-made, every bride will have the dress of her dreams. With updated, fun, and youthful designs, Haley Page is the perfect wedding designer for those looking for a fresh, modern wedding dress. Page has received global recognition for her collections, and her dresses are worn by celebrities like Carrie Underwood, Chrissy Teigen, and Olivia Wilde. Based out of Australia, Grace Loves Lace is exclusively online with the exception of its showroom destinations. With the help of online stylists, brides can buy online confidently, knowing the dress will fit and be of high quality. All of their dresses consist of the most exquisite European laces and silks. Morilee is known for its high-end fabrics, intricate beading, and delicate lacework. The brand has a variety of collections, including collections for full-figured brides. This will ensure that every bride will have the perfect dress for their big day. Known for timeless style with a modern twist, Anne Barge has both a couture line and a more moderately priced bridal line. Since its inception in 1999, the line has utilized high-quality fabrics, embellishments, and embroidery from locations around the world. If you are looking for a timeless wedding dress, Anne Barge is a great option. Marchesa was founded in 2004 by British designers Georgina Chapman and Keren Craig. Their wedding dresses marry intricate detailing and femininity perfectly. And, while based in New York, Marchesa designs are available worldwide. Finding your perfect wedding dress is meant to be an enjoyable experience, not one filled with frustration. This list of the best wedding dress designers is going to help make sure that your search is enjoyable and something that you can look back on fondly. 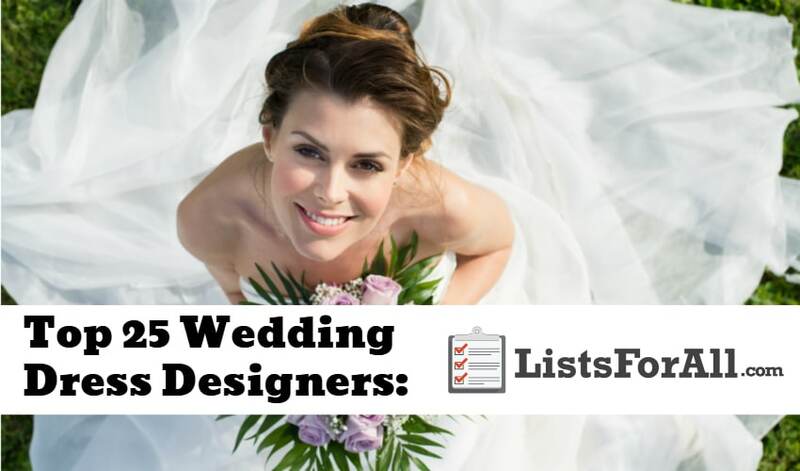 Regardless of your wedding dress taste or style, this list is going to have a designer that speaks to you. So whether you are looking for a traditional wedding dress, one that is more modern, or anything in between, the designers on this list will have something that speaks to you. And, even if it isn’t for your wedding, the dresses from these designers are still fun to look at and appreciate. Do you have a favorite wedding dress designer on this list or maybe from somewhere else? We would love to hear about it in the comments below.